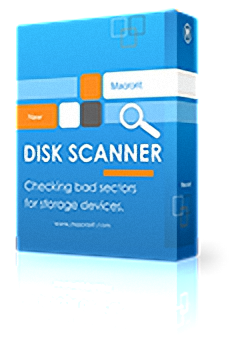 Macrorit Disk Scanner is a smart bad sector scanning software that can help you quickly test the disk and mark the location of bad sectors.Hard disk «bad sectors» is the most common problems of the hard disk. 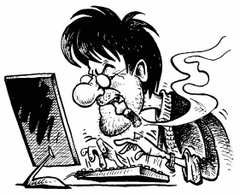 Bad sectors are little clusters of data on your hard disk that cannot be read. Hard disks with bad sectors means the disk is not safe to store data; it will eventually lead to the important data loss of the hard disk or partition as well as errors with running files and the hard disk speed will slow down significantly and blue screen errors may also occurs. New! Full support 512Byte/1K/2K/4K sector size. New! Added splash screen, more friendly interface. New! Added portable edition for windows, automatically save log files to desktop. 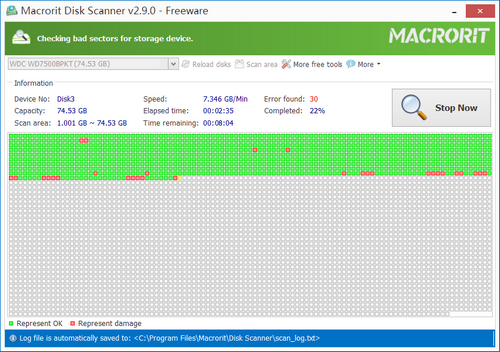 Support to check and scan whole disk, partition, free space. Support to automatically shut down computer while finish scanning. Scan result will be automatically saved in the specified location. Scan disk with super-fast speed. Mark healthy sectors in green and errors in red. Small portable tool, 100% clean, safe, no spyware, no adware, no virus. Force to shut down or stop scanning process is supported. NO harm for computer. Supported Storage Devices: DE HDD, SATA HDD, SCSI HDD, FireWire HDD, SSD, USB HDD, External HDD, Hardware RAID, Floppy drive, USB flash drive, Compact flash card, Secure Digital card, Memory card/Memory stick, Micro card, Zip drive, IPod, Other storage devices. Size: 5,80 / 8,76 MB.